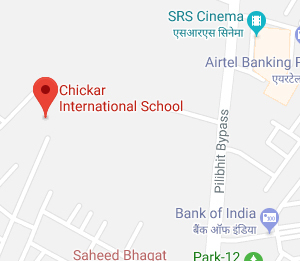 Chickar International School is affiliated to the C.B.S.E. examinations and imparts education on the basis of an international curriculum. The affiliation number is 2131243. In a world of ideas, we prepare students to face new challenges and urge them to seek originality. While providing a global platform, we believe it is equally important to root a child in our rich Indian culture and heritage in a secular environment which respects every creed. Our curriculum and activities reflect this. Inculcating a respect for human dignity is another objective for which we strive. We teach our students to reach out to others through community oriented programmes and our S.U.P.W (Socially Useful Productive Work) classes emphasize the value of work ethics and community service. Teaching at Chickar International School is student-centered, project-based, and incorporates the multiple intelligence concept. While the general curriculum is followed by every student, she is also encouraged to develop her inherent talents and interests in academics, sport, theater, art, music and dance, for which the best facilities are available.